Dr. Kraft specializes in primary care sports medicine. He graduated from the University of Illinois College of Medicine in 1989. He finished his pediatric residency at IU/Riley Hospital in 1992 and his sports medicine fellowship at Methodist Sports Medicine in 1994. Dr. Kraft has been providing care and game coverage for athletes of all levels in the Indianapolis area for almost 25 years. He is one of a few physicians in Indiana specialized in both pediatrics/adolescent and sports medicine. 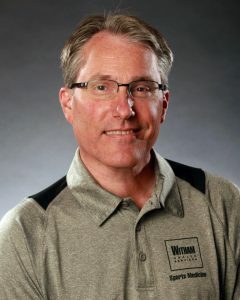 Dr. Kraft joined Witham Health Services in November 2017 as Medical Director for Witham Sports Medicine. Dr. Kraft brings a wealth of sports medicine experience previously as a team physician for Indy Eleven, Warren Central High School, Ben Davis High School, New Palestine High School and Western Boone High School. 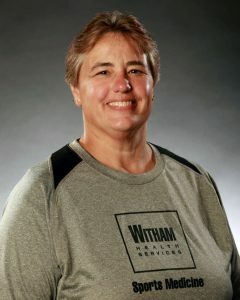 Susan is a certified/licensed athletic trainer working with Lebanon High School athletes. Susan is an Indianapolis native who graduated from IUPUI in 1997. She has gained experience working with middle school through college athletes since starting her athletic training career in 1998. The majority of her career has been spent at the high school level. At her previous school, Susan received the National Athletic Trainers Association’s Safe Sports School Award. She also holds a Workplace Teaching License and is an American Heart Association CPR instructor.